McNabb: From Nissan, to Mercedes, to Nissan, to GM, to Maserati. 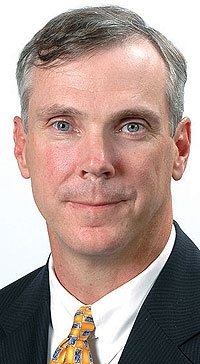 TURIN/DETROIT -- Mark McNabb, who has resigned from General Motors after 13 months, will lead Maserati North America Inc., Maserati announced today. McNabb, 48, will replace Marti Eulberg, who left the importer last month as CEO. McNabbs departure was announced last week in resignation effective June 1.He was hired by GM to lead Cadillac, Saab and Hummer and wound up trying to find buyers for Saab and Hummer. Eulberg left to pursue other opportunities, the company said in an April statement. Her past positions included vice president of marketing and sales at Jaguar Cars North America and vice president of Volvo Cars of North America. McNabb joined GM after resigning as senior vice president of sales and marketing at Nissan North America Inc. He had spent the first 20 years of his career at the Nissan and Infiniti divisions. In late 2005 he left to become head of marketing at Mercedes-Benz USA. He became vice president of Mercedes sales before returning to Nissan in June 2007. McNabb inherits a difficult situation at Maserati. U.S. sales of Maserati cars declined 57.7 percent this year through April to 382 units, from 904 units in the same period the year before. The drop in the United States -- Maseratis biggest market -- is part of a global slump of luxury and sport cars. According to figures released by parent Fiat S.p.A., Maserati worldwide sales declined 48 percent to 1,157 units in the first quarter. Revenues plunged 40.4 percent to 115 million euros ($161.0 million), and trading profit fell 70 percent to 3 million euros ($4.20 million). Trading profit is operating profit before extraordinary items. ENGLEWOOD CLIFFS, N.J., May 27, 2009 -- Effective June 1, Mark McNabb will be appointed as President and CEO of Maserati North America, Inc.
Mark brings with him well over 20 years of experience in the automotive field. Most recently, he held the position of Vice President for the GM premium brands (Hummer, Saab & Cadillac) in North America. Previously, Mark gained experience with Nissan Motors and Nissan North America where he held high level senior positions, such as Senior Vice President Sales & Marketing and General Manager for Nissan North America and Corporate Vice President & Corporate Officer of their Infiniti Global Business Unit. Maserati North America, Inc., headquartered in Englewood Cliffs, N.J., is the exclusive distributor for Maserati-branded vehicles and products in North America, including the recently introduced Quattroporte Sport GT S high performance luxury sedan and the GranTurismo S Automatic high performance luxury sports car. For more information, please view www.maserati.us.